Background and objectives Prior studies have shown that sevelamer attenuates progression of arterial calcification and may reduce the risk of death compared with calcium-based phosphate binders. In clinical practice, however, sevelamer is used not only as an alternative but also as an add-on therapy in patients already being treated with calcium-based phosphate binders. We analyzed the Dialysis Outcomes and Practice Patterns Study (DOPPS) data to test the hypothesis that the initiation of sevelamer is associated with improved survival in patients on hemodialysis treated with calcium-based phosphate binders. Design, setting, participants, & measurements We included 12,564 patients from DOPPS phase 3 and phase 4 (2005–2011) who were prescribed calcium-based phosphate binders at baseline or before sevelamer treatment. Mortality risk was assessed using a sequential stratification method to identify as-yet-untreated patients who were appropriately matched to the newly treated patients on the basis of their risk of death. Results Of 12,564 patients, 2606 were subsequently treated with sevelamer hydrochloride or sevelamer carbonate. After beginning sevelamer therapy, mean serum phosphorus levels decreased by 0.3 mg/dl in the first 4 months and gradually decreased thereafter. We matched 2501 treated patients with at least one as-yet-untreated patient. Patients treated with sevelamer had a 14% lower risk for mortality compared with as-yet-untreated patients (hazard ratio, 0.86; 95% confidence interval, 0.76 to 0.97). Similar results were observed in the sensitivity analyses when changing the matching calipers or the treated and as-yet-untreated ratios, and by using propensity score matching. 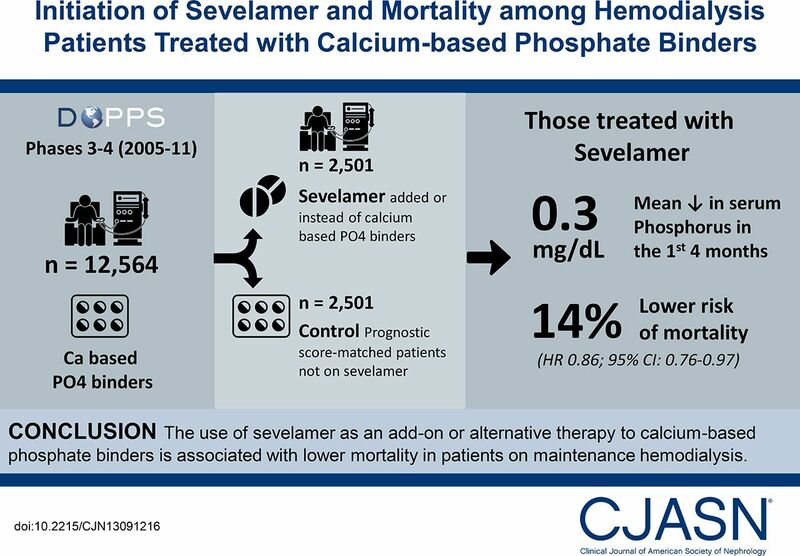 Conclusions The use of sevelamer as an add-on or alternative therapy to calcium-based phosphate binders is associated with improved survival in patients on maintenance hemodialysis.